As the resident Canadian here at iSlayTheDragon I felt it was about time that my home country got a little bit of the gaming spotlight. Fishing may not be the first thing that pops into your head when you think of Canada but Nunavut is an excellent subject for this unique card game. So get ready to head north (or whichever direction Canada is for you) and set sail! 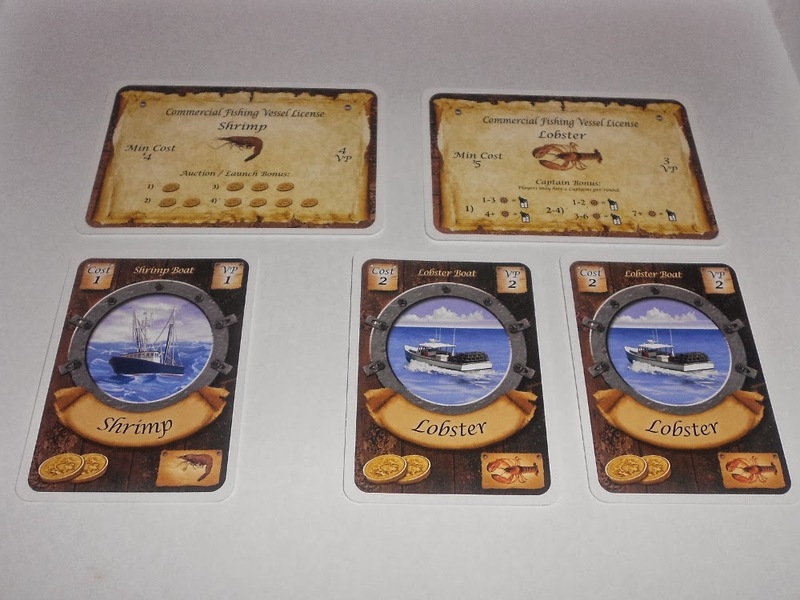 Fleet is a card-based auction and engine-building game about running a fleet of fishermen in Canada. Much like a number of games that John has been looking at lately, Fleet has the multiple-uses for cards mechanic. 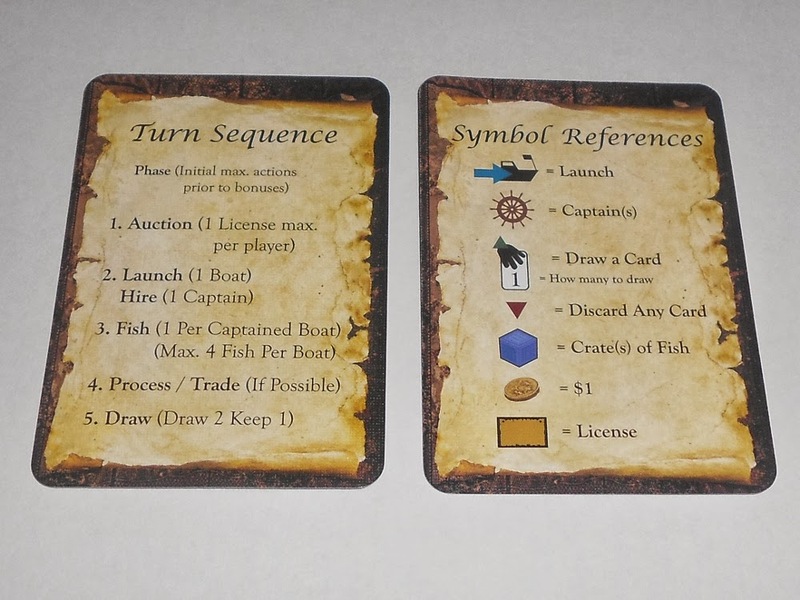 Each player has a hand of cards that can each be used in one of three ways: spent as currency, launched as a boat of its corresponding type, or captaining a ship. We’ll keep these uses in mind as we look at the basic flow of the game. 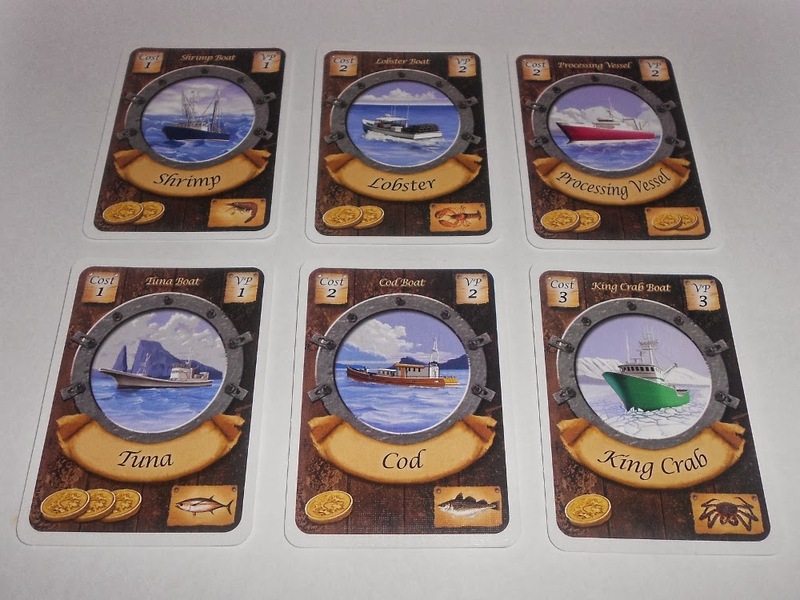 There are six different card types in Fleet representing the various vessels that you’ll be sending out to catch fish. Each type also has a corresponding license. All cards and license of each type are identical so, for instance, every Cod card and license will provide the same benefit. The cards also have a monetary value listed which is determined by their type. When purchasing anything during the game you may discard cards to spend the amount indicated on the card. Players begin the game with a hand consisting of one of each type of card such that everyone has an equal start. In order to do any kind of fishing you will first need to acquire the proper license. At least that’s what the license people want you to think. The licenses provide two benefits once they have been acquired. First, they will let you launch boats that corresponds to the license. For instance, having a Shrimp license will let you launch Shrimp boats. Second, they provided an economic bonus (discounts or card draw) and may have an additional related secondary effect. These bonuses improve as you acquire more licenses of the same type. The licenses are available through an auction that occurs at the beginning of every round. Players may acquire at most one license and are out of the auction entirely once they have received one for the current round. There are a number of licenses equal to the number of players available and the starting player begins by selecting one to auction off or passes (thus withdrawing for the remainder of the auction phase). Once a license has been selected bidding proceeds in clockwise order until all players have passed and the highest bidder pays for and receives their license. The next available player likewise chooses a license from what is left and another auction occurs. This is done until all players have received a license or passed. At the conclusion of the auction the market is refilled up to one license per player so you can get a glimpse at what will be available in the next round. Now that you’ve got your license you can start some fishing. Since the license people have to stay in business you are restricted to only launching boats that match your licenses. You can launch one boat per turn and doing so costs the allocated amount and allows you to take the boat and place it in your fleet. The boats that you’ve launched aren’t going to catch fish on their own so you’ll need to hire a captain if you expect to actually catch any fish. Luckily any card can be used as a captain regardless of their type. You can hire one captain each turn, to do so simply take a card from your hand and place it face down on one of your un-captained boats. 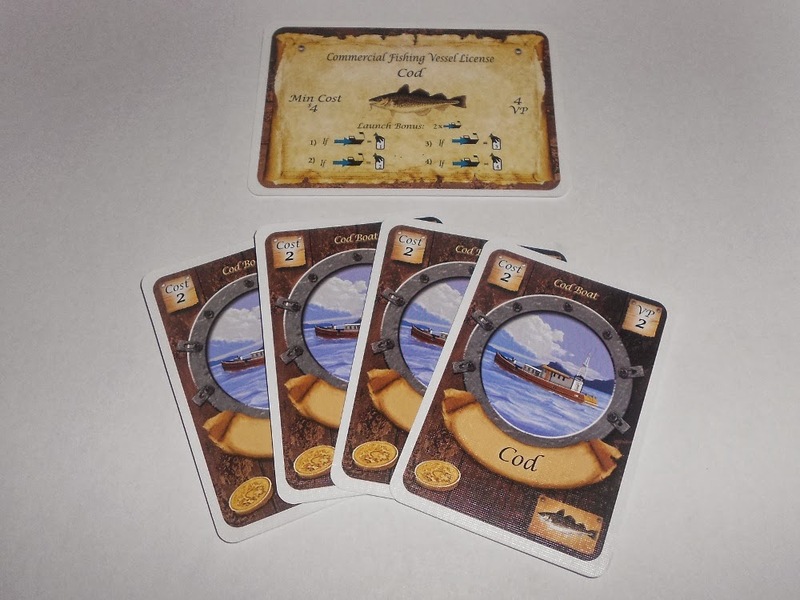 With your ships launched and captained you can get to the fishing. Each boat that has a captain will catch one fish from the supply up to a capacity of four fish per boat. If a boat is at it’s capacity it will no longer do any fishing. So what good are all these fish if you just let them sit around on your boats (besides points of course)? Wouldn’t it be nice if you could get some cash out of them to invest in your business. Well you guessed it, you’re going to need a license to do that. The Processing license allows you to take a fish from each of your boats and store them to be spent as cash in later rounds. You can additionally trade one of the fish stored this way for card(s). Ahoy! Boats with captains actually go out and gather fish, who’d have thought? You’ll finish off the round by drawing a couple of cards and keeping one of them, discarding the other. As you might note, this nets you only one card which isn’t a lot of card draw considering how many ways to have to spend them. This is where your licenses come into play, they each provide additional card draw or discounts that make it easier to make additional and more expensive purchases later in the game. Particularly important are the Premium licenses (King Crab and Fishermen’s Pub) which are much more expensive than the other licenses but are worth a lot of points at the end. The game ends upon completion of the round when either the supply of fish is exhausted or there aren’t enough licenses to fill back up to the necessary amount. Both the supply of fish and number of licenses is adjusted to suit the player count so the game will end at approximately the same time regardless of the number of players. Points are awarded for launched boats, purchased licenses, and the fish that you have on your boats. The player with the most points wins and is crowned King of the Sea (or at least Nunavut). Bounty of the Sea or Stuck in the Mud? There’s no shortage of games about trading in the Mediterranean but fishing in Canada seems to be relatively unique and really helps Fleet stick out. I’ll admit that I don’t know much about fishing so I can’t speak on how accurate everything is in Fleet but the theme provides a natural rule structure. Aside from the Processing license it doesn’t seem like the abilities tie in very closely to their type so in that regard the theme is a bit thin but I like the flavor that the different licenses provide. License abilities aside, most of the other rules work nicely within the theme and make the game explanation and first play go relatively smoothly. The art itself is very nice and compliments the theme excellently. Each boat and license has a very unique appearance and can be quickly identified and matched up, something that is extremely important when you’re scanning your hand during the license auction. The card and license layout is excellent and I found icons to be very intuitive and easy to read. The one thing that might not be entirely clearly is when certain card draw abilities from licenses occur but after referencing it in the rulebook it should be easy enough to remember. 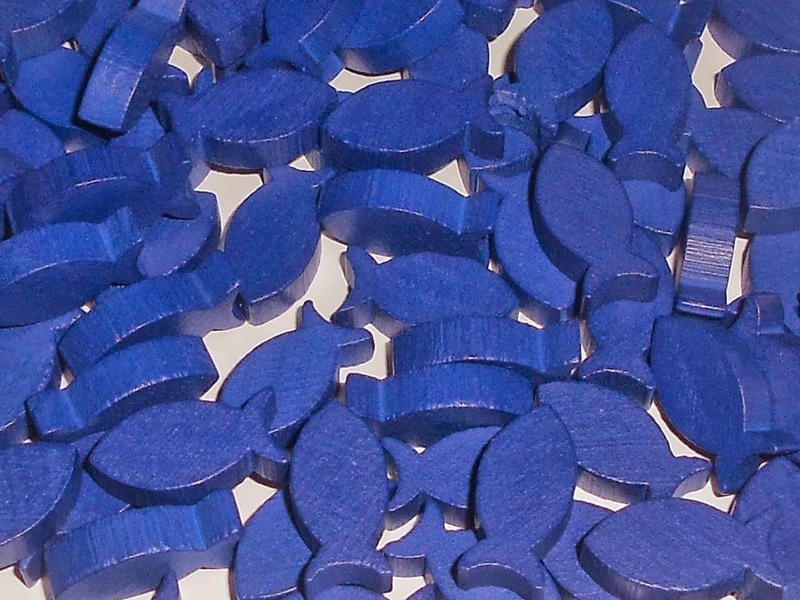 One note on components, I have the kickstarter version that comes with nice fish meeples instead of cubes. As you may have picked up from John in his string of recent reviews and articles praising having multiple uses for cards, we like this mechanic. In Fleet it provides interesting decisions for what licenses you should consider by looking at the boat types and money you have in hand. It also nicely mitigates luck of the draw by letting you use cards for money or captains if you are not happy with the type. Although the cards do have multiple uses it doesn’t present overwhelming options as each way to use the cards feels intuitive and simple. I would describe Fleet as an efficiency engine building game, you are acquiring licenses and boats in order to acquire better and more licenses and boats (for points!). The core mechanic that really makes this work and the game’s central focus is the auction. It may seem like there is more going on in Fleet then there really is with all the license powers and multiple uses for cards but it really does boil down to what you do during the license auction. I’m not saying that all these things are superfluous simply that they are designed to support the central auction mechanic. Part of what makes the license auction so meaningful is that it has such a large impact on how your turn will play out. The licenses you buy determines what type of ships you can launch (from your limited hand selection), incentivizes you to focus on certain actions, and alters the normal pacing of the game (launch 2 boats, hire 2 captains). How much money you spend impacts what’s left in your hand to actually carry out any plans that you had for how to use our licenses. All this to say that there is a lot to consider when you are deciding what license to buy and how much to pay for it. In fact there is so much to consider that it may seem that the rest of your turn is fairly automated after the auction. This isn’t because it’s all a no-brainer but rather due to the fact that you likely already thought through what you were going to do in order to determine what to buy. This places the majority of the decision space in the game into the license auction phase. I think this also makes the auction itself very tense as everything hinges on this decision. Is a license important enough that you’re willing to overspend and not launch a boat this turn? Are you willing to wait for the less desirable license and get it for a great price? Should you pass entirely and launch more boats or save up for one of the premium licenses in the next round? Premium Licenses provide big points! The auction itself, as auction mechanics often do, keeps the relative power of the licenses in check. Some of the more desirable licenses cost more but if they are rare early in the game then they may be more pricy to acquire. This is supported by the unique tie that the licenses have to the boat cards. Each card type has an associated cost and point yield for launching as well as a monetary value for spending. These amounts help to balance out the relative usefulness of the licenses and may encourage players to pursue the less useful ones. This compliments the auction mechanic well and creates a unique feel of each license type. The powers of the licenses are extremely well designed, they provide varied benefits but fall within a relatively consistent power level. All but one of the standard licenses (Processing) will net 1 card or 2 money (roughly equivalent) when used effectively. The consistency of the license abilities provide nice structure to the overarching strategy of the game to allow for planning. However the secondary benefits and emphasis on different phases of the game greatly shapes their usefulness and adds nice variety. This is particularly compelling when you consider how the licenses synergize. Being able to launch multiple boats (Cod) is nice but becomes much more useful when you can also hire two captains (Lobster) or launch them at a discount (Shrimp). The premium licenses also provide variety by allowing players to emphasize spending money at the cost of launching additional boats. 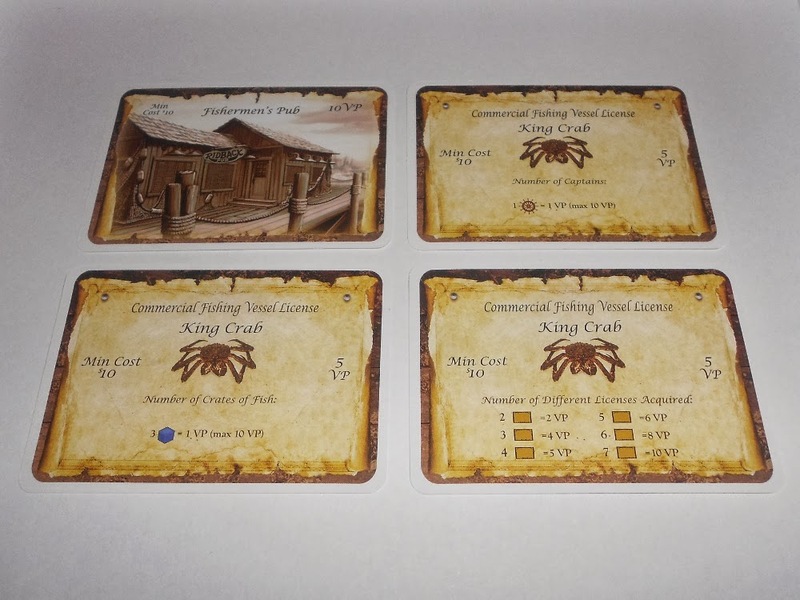 The King Crab license in particularly provides end of game goals and access to the highest point ships, both of which provide notably varied strategies. Since it’s an engine building game, the transition from barely getting by at the beginning to having interesting ways to spend your bounties near the end is critical. It’s also very important that the game actually ends before things become too easy and the game loses its tension. Fleet deliver on both fronts. Some licenses increase the pacing of the game, allowing players to do more with their funds as the game progresses, and premium licenses provide a big financial investment that either has to be saved up for mid-game or won in a bidding war at the end. The end game triggers at just the right time, allowing players to experience one big payoff from their hard work while the tension is still high. 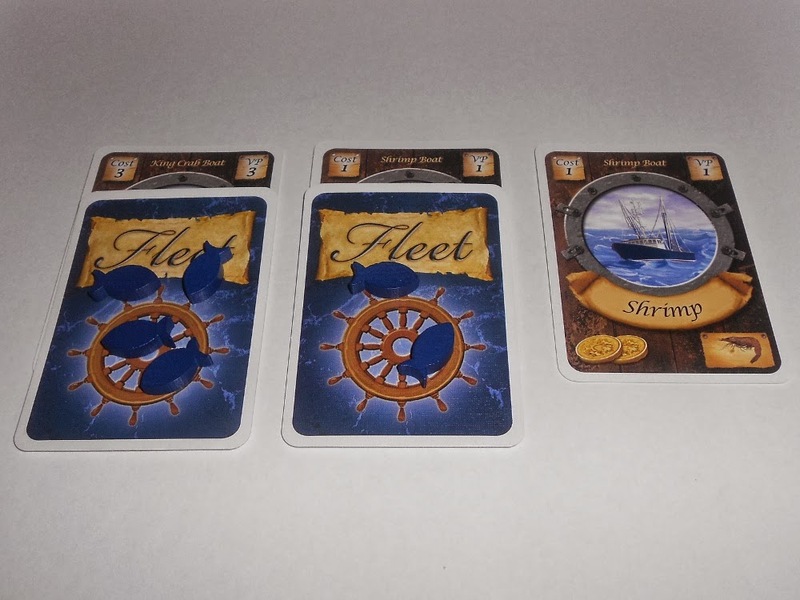 Fleet is also a very tight efficiency game and while it provides engaging and tense decisions it can suffer from some of the drawbacks of this model. The first is that it can come across as relatively dry. The price and VP printed on the cards and licenses doesn’t attempt to conceal the fact that every action has a direct cost and reward. This can lead to the second issue, especially in an engine building game, the runaway leader scenario. Particularly evident when an experienced player gets ahead because they know how to more efficiently set up their engine and are rewarded with a better position to continue doing so. I don’t personally see either of these issues as a problem as it rewards repeated play and deep understanding of the game system. Just remember that seasoned players should play nice when teaching new players or else they might sour the experience, I hold this as a generally rule of thumb regardless of how punishing a game may be to new players. I did find a couple of things to be somewhat problematic with Fleet, nothing that ruined the game but more annoyances. The first is the awkwardness of the Processing and Trading phase. It seems really odd to me that there would be a whole phase of the game that you may just skip over every turn, not by choice but because you didn’t have access to it. This boils down to more of a semantics thing I think but it is somewhat confusing to explain to new players that they can just ignore that phase until (and if) they acquire a Processing license. I feel like there should have been a cleaner and simpler way to do it. Once you know the flow of the game it’s not really a problem but it seems awkward and confusing at first. Next up is the anti-climatic nature of card draws on your last turn. I know it’s extremely nitpicky to complain about not having any use for cards at the end of the game (tie breaker?) and so just don’t draw cards at all if you have a problem (outside of the Cod license if you need some captains). I’m not sure exactly why it bugs me, probably because if you follow the normal flow of the turn then you will be doing something (drawing cards) that has no impact on the game. Just like with the Processing phase I find it to be somewhat awkward the first couple of times you play. On to my most significant issue, diminishing tension and increased randomness with lower player counts. Since Fleet is an auction game, less players will generally decrease the tension that occurs and lower the variety of licenses available during auctions. On top of this, the rules suggest randomly removing a number of licenses (with a specific subset of premium licenses) from the game. The removing is absolutely necessary for pacing but making them random and hidden seems detrimental to the game. I would either prefer removing a specific set of licenses or revealing which licenses have been removed (I do the later). Fleet is an extremely tense engine-building game that has a unique theme and wonderful artwork to match. 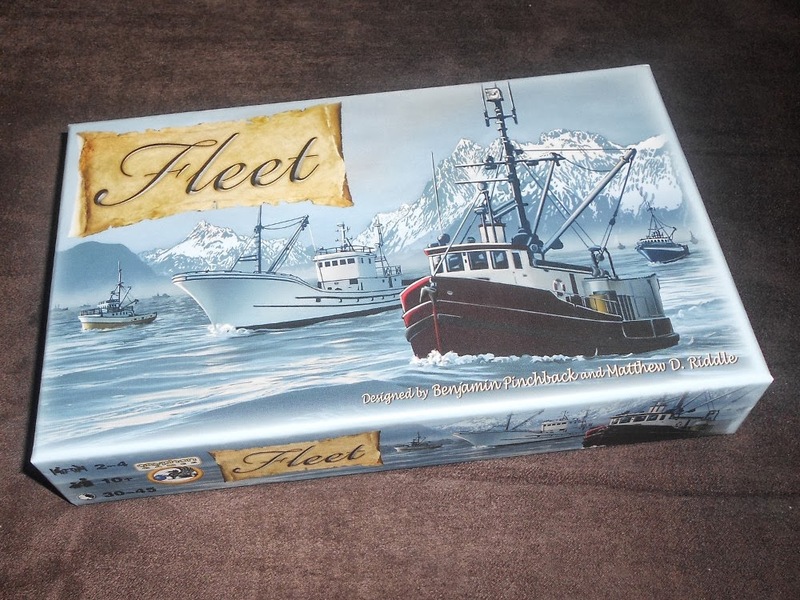 If you like auction games that offer interesting decisions and require you to plan your turns as efficiently as possible then Fleet has a lot to offer in a short time frame. It’s ideal with the full compliment of players but still plays smoothly with just two. I really enjoy this little card game. It seems that their forthcoming Arctic Bounty expansion is going to introduce a 2P variant with a dummy bidder (the description reminds me of the dummy bidder in Homesteaders) to increase tension in the 2-player game. There are two things I don’t like about this game. First, the runaway leader problem in a 2-player game. For me, almost all my sessions at that player count have been a blowout (not always the same player wins, either). Secondly, the rulebooks description of how to remove licenses to scale for 2- or 3-player games is incredibly poorly written, IMO. Had my mind running in circles for about 10 minutes. After several games of referencing that portion of the rulebook, I wrote my own explanation on a notecard and stuck it in the box. I’m really looking forward to the expansion for the increased variety of licenses and boats to create more interesting combinations. I remember hearing about the 2-player variant and had intended to mention it but forgot as I haven’t actually read up on it yet. I’m very interested in that aspect of the expansion as well since I particularly like games the scale down nicely for two players. For now I’ve mostly stuck to playing with 3-4 players. I also noticed that the rulebook was a bit confusing in spots. I didn’t think it was too bad overall but I found the Processing Vessel/License to be kind of counter intuitive with having its own phase and it doesn’t seem like it should work like the other boat types but it does. I could see this leading to some confusion especially if you don’t read closely. Yeah, for my first game, we definitely played (wrongly) that only Processing Vessel *boats* could process fish. We cleared it up by visiting the rules forums on BGG.